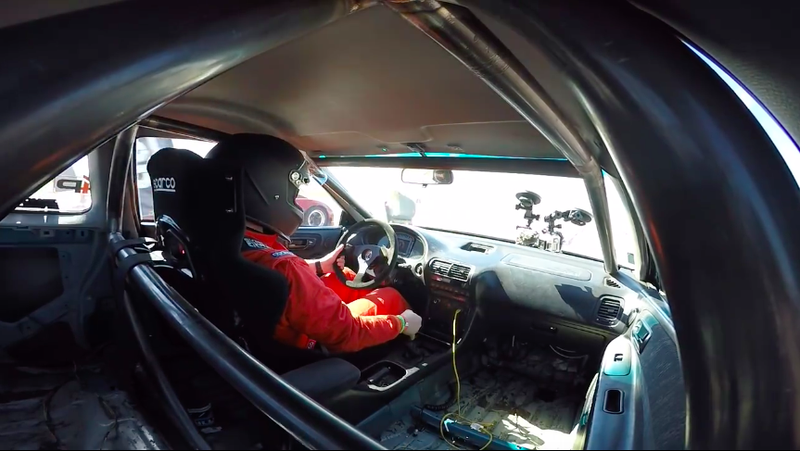 Right in the middle of all the GT-Rs, Porsches and Lamborghinis that showed up to the Heuberger Subaru Pikes Peak Air Strip Attack at Colorado Springs Airport earlier this month was a seemingly humble 1994 Acura Integra driven by one Myles Kerr. But this is no ordinary Integra. It’s gone from being a 12-second car that churned out just 287 horsepower to a half-mile speed monster that goes over 200 mph and pumping out 1000 HP thanks to a Precision 6870 turbo setup. This event is one of the biggest half-mile events of its kind and draws a host of high-powered builds, and there, Kerr’s Integra joined the 200 mph club. We’ve got the POV inside video of what it looks like inside. As far as POV videos of insane airstrip passes go, this one is not only loud but shows just how little drama plays out when everything is clicking perfectly under the hood. But when things like aerodynamics, engine tuning or brakes get out of hand we, unfortunately, get money shots of transmissions exploding or engine internals flying out the bottom end at obscene speeds. Keen eyes will notice that in his first shifts from third to fourth and fourth to fifth, Kerr barely lifts off the throttle and gives it the full beans as that giant turbo forces in air at triple-digit speeds. If you check out the official top 10 speeds of June’s event, it’s pretty hilarious running across Myles Kerr’s Integra in the list. You’ve got a Nissan GT-R, a handful of Lamborghinis, a Corvette and oh, a 1994 Acura Integra. His official speed at the end of the day barely got him into the 200 mph club, but he’s in there. The last three on the top 10 didn’t make it. Props to Kerr for nursing along such an awesome build that he’s had since 2006. I’ll keep my eyes out on just how fast he’ll take his Integra in the future.